The Biston growth was created in the 18th century by Mr Biston. Its wines were classified by the Guyenne Intendance in 1776. Later, in 1850, the first edition of the Féret mentions Biston among the leading Moulis wines. 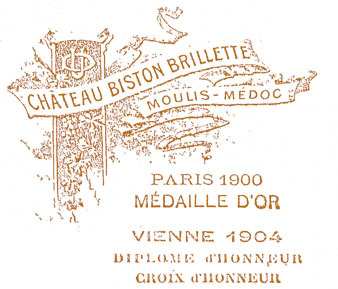 In 1860, Château Biston became Château Biston-Brillette, ranked 1st Cru Bourgeois Supérieur of Moulis. Since then, Château Biston-Brillette has remained in its ancestral position, even though the “adjuvants to growth brands”, as they were known during the Belle Epoque, are no longer governed by the same laws today. During the 18th century, in heady economic times for Bordeaux wines, Mr Biston, who owned a few hectares of vines in the commune of Moulis, created his own growth. In the section entitled “Parishes behind those along the river”, in the wine classification drawn up by the Bordeaux Intendance in 1776, the Biston growth ranks among the first four historical growths of Moulis. The château of Mr Biston was then located across the road from the church, with adjacent vineyards. The price of a tun of Biston wine, from 300 to 240 French livres (the price level of a 5th Pauillac growth), shows that its quality was recognised by the Bordeaux trade. During the 19th century, the Biston growth continued to assert its prestigious origins. With some thirty hectares of vineyards since the Brillette outcrop was cleared, the growth produced 25 to 40 tuns of wine when the Napoleonic Land Register was drawn up in 1828. In the first edition of the Féret, in 1850, it was ranked 6th among the reputed growths of the Moulis Appellation. In 1860, its owner, Mrs Menessier, named it Cru Biston-Brillette. With the birth of a brand that became much sought-after by English customers, Biston-Brillette finally revealed the origins of its identity by becoming a First Cru Bourgeois Supérieur. Ulysse Daurat was awarded medals and recognition, and upheld the rank of Biston-Brillette among a handful of growths that were the elite of Moulis wines for centuries. From the end of the 19th century to the 20th century, in successive editions of the Féret, Château Biston-Brillette constantly maintained its position among the leading Moulis growths.